Thanks for popping by. I have another Christmas card to share with you today and it is nothing like what I envisioned when I started! I wanted to play along with the Merry Monday Challenge - Add a Ribbon but wasn't quite sure what I wanted to do! Initially I thought maybe I'll make a card without a stamped image (big challenge for me!) and had thought of purple and silver! I sat at my desk for over an hour, while bubs was having her nap, and nothing came to me so I gave up. Then when she went to bed for the night I started going through some old stamped and coloured images and found this one. Poor James the Bear has been sitting in a folder for years...I'm not sure how many..three at least! I thought it was about time is was put on a card. I knew I had quite a stash of green and red ribbon so thought I would give the challenge a go. It was good to use up some of my ribbon. I bought a tonne of it years ago for cards and then wasn't sure how to use it and decided it wasn't really my thing! I'm actually surprised I managed to find the name/type of ribbon I used on this card, it's so old. Adorable card, this is such a sweet image. Thank you for joining us for Merry Monday. Adorable, for sure. Love this image and the ribbon is perfect. 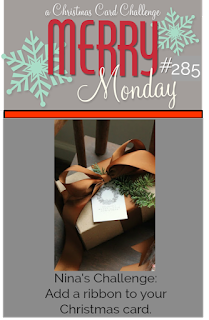 Thanks for sharing with us at Merry Monday Christmas Card Challenge. Your layered ribbons look perfect with your cute Christmas bear! Thanks for playing Merry Monday this week! Love the adorable bear image and your coloring looks fabulous. The red and green ribbons are the perfect touch. Thanks for sharing with us at Merry Monday. This is so cute. Love the little bear. Sweet little James..gorgeous card Andrea.. Thank you so much for sharing your project with us at Winter Wonderland..
LOTV images are so cute and you have coloured this one beautifully! I love how you used the ribbon and the textured background is a perfect finishing touch. Thanks for sharing with us at HLS and I hope you will join us again soon. Cute card!!! Thanks so much for participating in our WINTER WONDERLAND challenge. Hope you participate in our next challenge!! Have a happy crafty day!! !